Rajam leaned against the wall and continued her prayers as her fingers counted the basil beads of the rosary. She was a short, plump woman of sixty five or thereabouts with a broad face, rounded chin, short nose and a rather dark complexion. Invariably clad in a traditional sari, she wore her long grey hair in a tight knot. Her small kind eyes were magnified by the thick glasses she persistently sported. Nonetheless, these spectacles were of no use as she was almost blind. In spite of her ordinary looks, she had a calm and caring countenance that endeared her to people. Rajam was married when she was very young, as early marriage was the norm in olden days. Her husband Ranganathan was a scholar, orator and educationist. She bore eight children and family occupied all her time for many years. Too busy with her domestic responsibilities, she did not bother about her failing eyesight. By the time she sought medical assistance, it was too late. Glaucoma took away her vision. Notwithstanding the doctors’ verdict, she continued to hold on to her eye drops and spectacles, nurturing a flimsy hope. Rajam generally had an even temperament and hardly got angry or agitated. In the last few years of darkness, she had learnt to manage her life comfortably without eyesight. She and her husband shared a very deep and caring relationship of more than five decades. All in all, she was a contented woman, though she had her share of misfortunes. Presently, Ranganathan called out, “Rajam, listen to this verse... How beautifully the illusion of life is explained here...” He went on to read with relish. Ranganathan was seventy years old, with a lean tall frame, fair skin, bright eyes and sparse grey hair. His aquiline nose and prominent forehead gave him a majestic look. Ranganathan and Rajam shared a great camaraderie. He read out the news and all interesting items from the books to her. They listened to the news broadcast together and discussed issues pertaining to family, friends and neighbours. But, this did not prevent Rajam reminiscing about the meaning of existence. Her husband had an eventful and purposeful life. He continued to write religious columns in the news papers of the day. Her life had been consequential so long as she could see and be of use to her family. Now she was left only with darkness and her thoughts. “If only God makes my life more meaningful...” Rajam thought wistfully. Her mother was a medicine woman, who was a healer of great reputation and helped the village folks till her death. Neither Rajam nor her sister had an aptitude for the healing art. Rajam had only learnt a few basic remedies from her mother. With a sigh, she closed her eyes and started her prayers once again. Summer was always hot in these parts of the country. Rajam and her husband preferred to spend the evenings in the front porch. Stone steps from the main entrance of the house led to a cement platform extending up to the gate. On either side of the platform they had a simple garden with a few coconut trees, a mango tree and a margosa tree, in addition to various flowering plants. The gentle breeze from the trees eased the heat. At present Sumathi, their neighbour walked in with her two year old son and sat next to Rajam on the steps. They talked about the water problem and all other sundry issues as the child climbed on to Rajam’s lap. Sumathi went away with a confused and worried look on her face. “What is the matter Rajam? Why are you scaring that poor girl?” asked Ranganathan in a perplexed tone. Rajam frowned and said “I don’t know...” She was certain that the child needed a doctor, but honestly did not know why. All of them were stunned, including Rajam, who felt thoroughly confused. When Kamala pressed for an explanation, she could not give a convincing reply. She was nonetheless sure that the wedding ought to be stopped. Raghavan and Kamala left with discomfiture, while Rajam was puzzled and Ranganathan remained thoughtful. Raghavan and Kamala came visiting a fortnight later. Kamala sat by Rajam’s side and held her hands, as Raghavan recounted the events of the past weeks. It turned out that the groom was already married thrice and cheated the women. Two criminal cases were pending against him. Raghavan’s granddaughter fell for his charms, and it was sheer luck that the police tracked him down before the wedding. “I didn’t take you seriously... If we have made enquires when you warned us, we could have found out earlier... It is God’s grace that our dear child escaped a bad marriage... By the way, how did you know?” asked Kamala. Rajam had no answer. She later discussed these odd insights with her husband and could find no convincing explanation. “Anyways, these insights are useful... they help people... Aren’t they?” asked Ranganathan. Small incidents kept happening in Rajam’s life. She could tell where to find a misplaced object or suggest small things that made life easy for others. One day Rajam suggested that her maid took the umbrella while going out. “The sky is clear, amma...” Her maid went out laughing only to get drenched on her way. 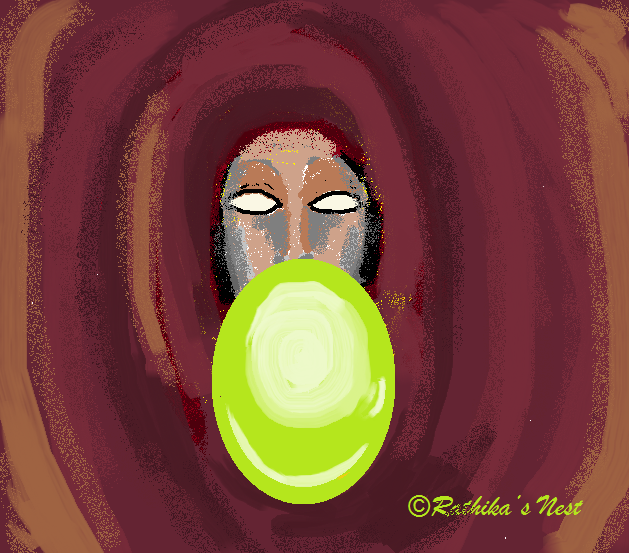 Rajam felt unnerved at times, not being able to make out what was happening to her. A ginger cat used to visit their house often and it had become a habit to feed the cat regularly. Rajam’s maid often grumbled about this habit. Hence, when the ginger mewed to announce its arrival on that particular day, she came out with milk reluctantly. “Don’t grudge... He won’t come again...” words slipped out of Rajam’s mouth. “He will come everyday... Who else will feed him?” retorted the maid. The following day, the maid came in breathlessly to announce that the ginger cat was killed by a stray dog the previous night. This incident rattled Rajam and occupied her thoughts all the time. She was worried sick and sought an answer to these strange experiences. As luck would have it, Rajam’s sister Ramani decided to spend a week with her. Yes, Rajam remembered. It was a weird feeling that she felt frequently. It might be an event, a conversation or a place. But she used to have a strong feeling that she had already experienced them and would make a fool of herself by voicing the same. She also had some vivid dreams about future events and they frightened her. These were, however, insignificant events about a dog’s litter, a kite, doll, a bloom and the like. Though these experiences never left her, she had learnt to ignore them to avoid embarrassment. “Yes... Indeed... What is that has to do with the current problem?” asked Rajam. “You don’t know our mother as well as I do... she was a much sought after medicine woman... not many people knew, that she was also a seer... she could see events beforehand and used this gift to heal people of their ailments...” Ramani sighed. “I never knew about it... How come nobody in the family told me?” asked Rajam. “Because nobody knew... Her times were difficult... women were not expected to play a social role... she knew that she was different... she lost her husband and had to look after two children... If people knew about her gift, they would have branded her a witch and ostracised her... so, she kept it a secret... nonetheless, she was wise to use her gift to help people...she did well for herself... even today, people talk about her with great respect...” Ramani continued in a gentle voice. “Why am I getting these insights now?” wondered Rajam aloud. “When God gives you a special gift like this, he takes away something else from you... Mother believed that she was blessed with the gift of seeing the future, but lost the marital bliss... You have lost your vision some years ago, and perhaps now you are ready... who can understand God’s ways?” replied Ramani. “Are you suggesting that the gift is likely to stay with me?” asked Rajam. “I think so...the more you use it, the more it will reveal itself... the more you give others, the more will come back to you... it is the law of nature... Rajam, there is nothing to be scared or ashamed of... go with the flow... understand that God has given you the second sight for a purpose...” Ramani’s wizened words rang true. Rajam closed her eyes and felt at peace with herself. Smrithi listened to her grandmother with rapt attention. Her long eye lashes glistened with tears. She was both fascinated and afraid at the same time. Smrithi was a pretty young woman of twenty five with a wheatish complexion, large dark brown eyes and a curvaceous figure. Her long, dark, lustrous hair and full pink lips enhanced her beauty. She sat leaning forward to listen to her grandmother, Rajam, who was lying on the bed. Rajam was emaciated and her blind eyes were staring into the space. Smrithi and her parents came down to live with her grandmother, when grandfather passed away. She knew that her grandmother was different and people thronged from far off places to meet her. Rajam had been meeting people day in and day out, from dawn to dusk for the past fifteen years. What she told her visitors gave them hope, solace and peace. A week ago, Rajam stopped meeting her visitors. Since then she neither ate nor spoke, until this morning when she summoned Smrithi for a private audience and narrated the story of her 'second sight'. Smrithi had been having strange dreams since childhood. They were so vivid as if she was directly witnessing a scene. As a child she used to scream when she had these dreams, which made her mother extremely anxious. Slowly she learnt to cope with the dreams by keeping quiet. Old lady’s grip tightened over Smrithi's hand and she felt an energy passing through it. Smrithi closed her eyes; something moved inside her and fell in its place. Rajam’s hand went limp and Smrithi placed it gently on the bed. She was not scared anymore and felt serene. Smrithi reached out for the crutch and lifted herself up. When she started walking the salwar blew in the air around her amputated right leg. After all, as God gives a gift, so He takes away another.